Winters are knocking our doors. ACs off, dry days ahead. Leave alone dry skins, oily skins are also demanding more of moisturizer now. 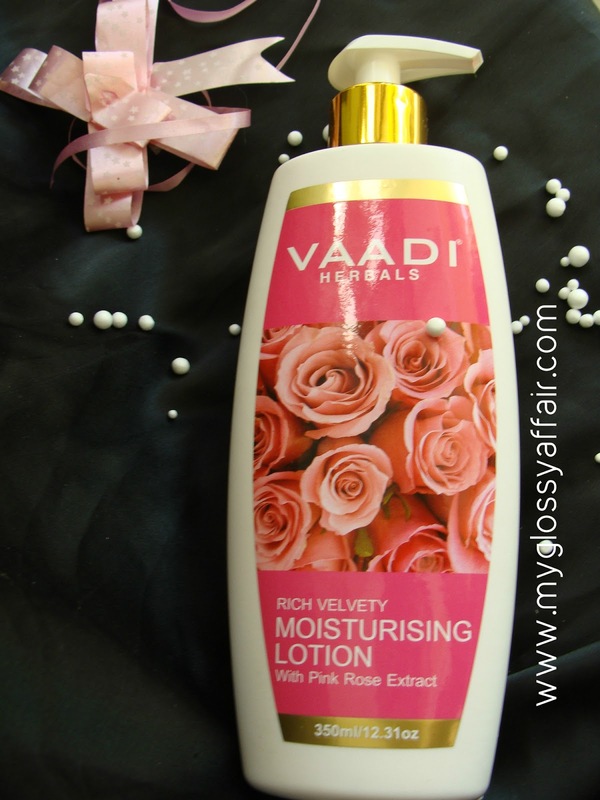 I have started using this body lotion from Vaadi which is pinky pinky with a light rose fragrance. Lets see if you can also get this super inexpensive body lotion for winters or have to skip it!! Why did I get Vaadi? It’s so super affordable with huge quantity. Superb. It says Deep Moisturising and it is and it is herbal too with very nice fragrance. An intensive all-purpose moisturizer, it is perfect for any skin-type. This great combination of natural emollients, Pink Rose & Goat Milk, helps the skin retain its moisture content and stay well-moisturized longer. Their rich multi-vitamin content penetrates deep into the skin’s layers to condition & soothe it; making it healthy and granting your skin a “velvety” feel and a “rosy” glow. It comes in a plastic bottle with pump dispenser which oozes the right amount of moisturiser. And the best thing is the pump has a lock-in feature too. You have to twist it anticlockwise to get the product out. Love everything about the packaging. It never leaks or spills and oozes right quantity in 1 pump. The consistency is neither runny nor too thick. Its just perfect. Its easy to take out the required quantity of product with the help of spray nozzle and it spreads easily without leaving any greasy feeling. • Pink Rose: Re-balances Skin’s Moisture Content. 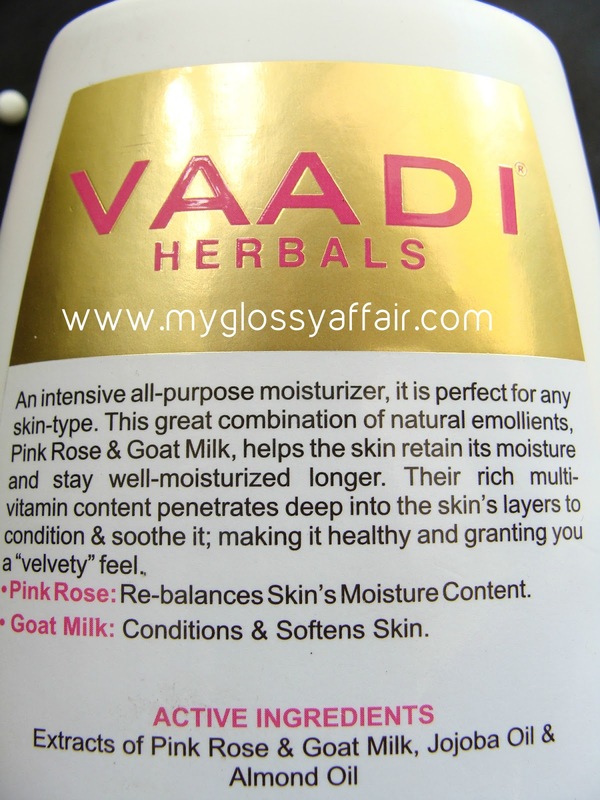 • Goat Milk: Conditions & Softens skin. Active Ingredients: Extracts of pink rose & goat milk, jojoba oil & Almond oil. Rs. 155/- for 350ml but the offer is for Buy 1 Get 1 free!! So, I got 700 ml in Rs. 155/-. Isn’t it awesome gals. 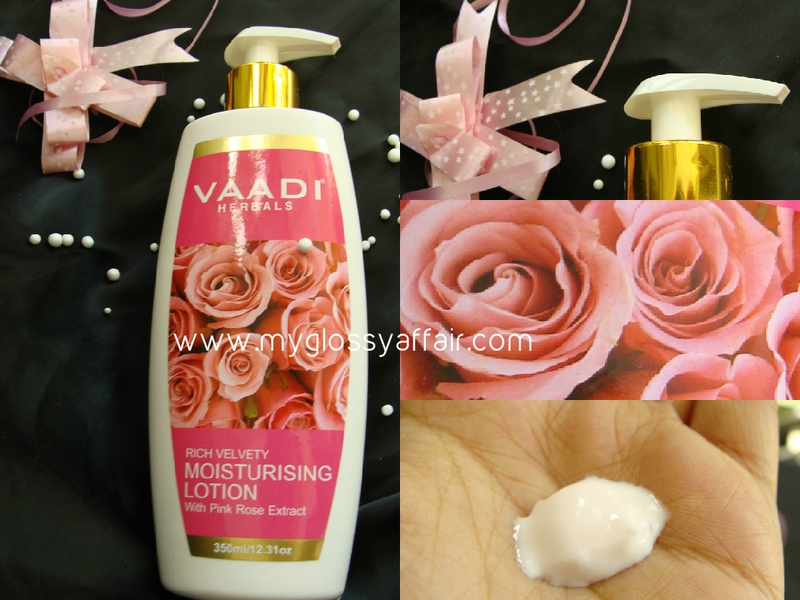 What I loved most about Vaadi body lotion is user friendly packaging, pump dispenser makes it so convenient to use. You don’t need to get pumping to get the lotion. You get only the required amount without any wastage. 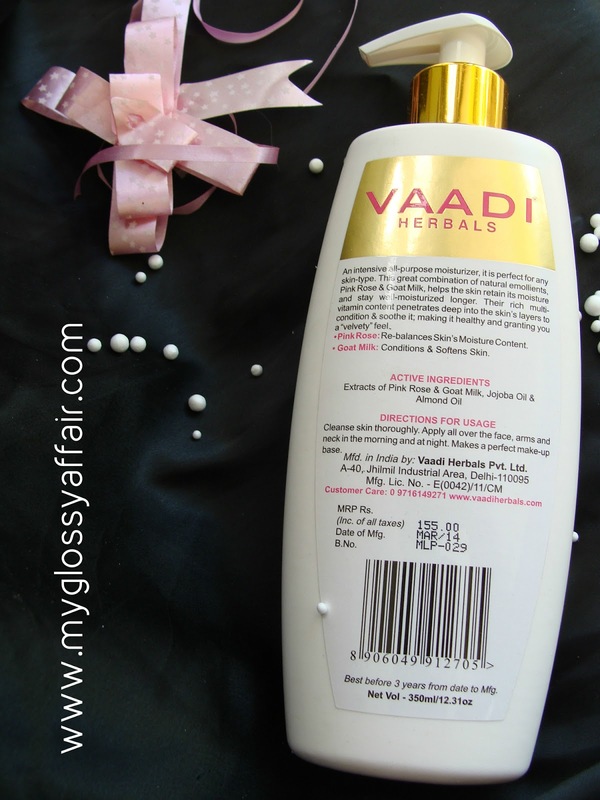 Vaadi herbals body lotion is perfectly moisturizing, it hydrates well and leaves skin soft and smooth and non-greasy. 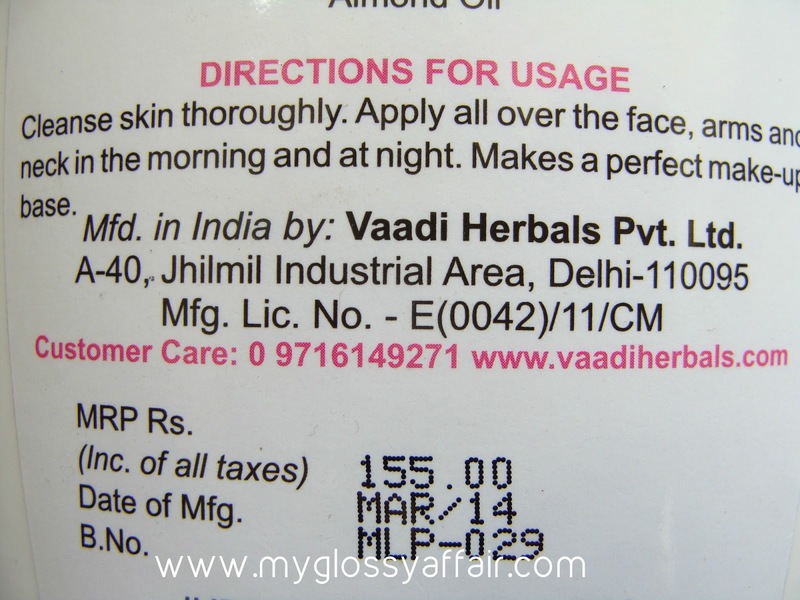 It is a perfect choice for winters for dry skin beauties on budget :). The fragrance is enticing, smells rose which is my favourite. Little bit lingers, rest fades but the fragrance is very light and not empowering. So, those, with sensitive noses will also like it :). If you are looking for an affordable body lotion and you are fond of using large amount of body lotion then this one is for you. And the quality is good too. Hence, with good ingredients and all the positives of this body lotion, I would like to add that it is totally recommended :). Works decent as a body lotion. Nice mild fragrance, doesn’t bother at all. Contains goat milk which is very good for skin. Hydrates and moisturises the skin well. Nice packaging with lock-in pump dispenser. 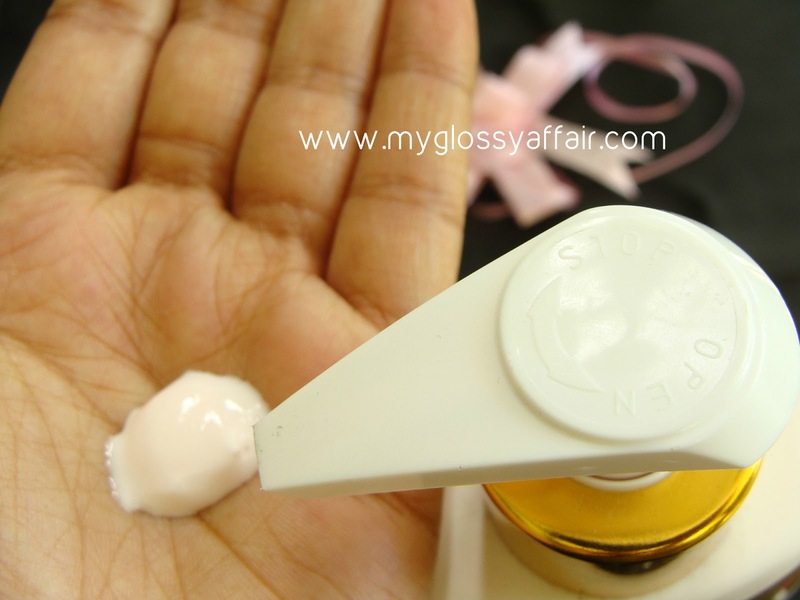 May be a little bit greasy for summers for oily skin but perfect choice for winters.